Welcome to Needlepointers.com! Bringing you craft projects and tutorials for 20 years. 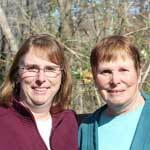 Annette and Chris, a mother/daughter team, have brought you craft projects and tutorials through this site for over 20 years! We know what you want because we're crafters, too! We update Needlepointers.com regularly and publish new videos each week, so keep coming back often. Look for our recent videos below and if you are interested in a specific craft, sewing or needlework category, look above for links to our department pages. Each departement will have a listing of recent videos on that topic. Departments also include many topics related to that craft where you can find many links to free projects, tutorials and more. How to recycle plastic grocery bags into plastic bag yarn also known as plarn. This sturdy plastic bag yarn can be used for lots of different crocheting, knitting and weaving projects.